HUBER HEIGHTS — Chief Master Sergeant John F. Bankowitz, USAF Retired, has lived his entire adult life in service to his country, serving in the United States Marine Corps and the United States Air Force, and in a distinguished career in the Department of Defense Civil Service. He is currently employed as the Air Force and Aerospace Instructor in Huber Heights. This year, he also celebrates twenty years of service to the Miami Valley Young Marines. The Young Marines is a national organization founded in 1958 by the Marine Corps League. The Miami Valley Young Marines is a local unit of the Young Marines, currently serving youth from Clark, Greene, Miami, Montgomery, Preble, and Warren counties. 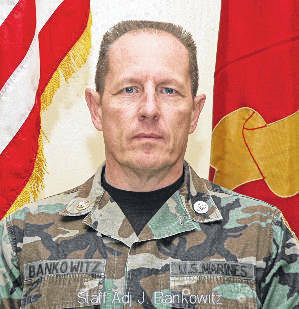 Chief Bankowitz served as Commanding Officer of the first Miami Valley Young Marine unit, formed in 1998, at the United States Marine Corps Reserve Center in Dayton. Chief Bankowitz also commanded the Southwest Battalion of the Young Marines which is comprised of three Young Marine companies in southwest Ohio. He is tireless in his support of national Young Marines objectives. Mr. Bankowitz stands as a role model for the Young Marines. Through his leadership and example, the Young Marines are systematically provided training and activity to promote their physical, moral, and mental development. Those who know John Bankowitz would say that he has been doing much more than “his part” for a very long time. Chief Bankowitz has a distinguished record of volunteer community service, primarily to the Young Marines of the Marine Corps League. In 2014 Chief Bankowitz was inducted into the Ohio Veterans Hall of Fame for the work he has done and continues to do in support of his community. Through his leadership, commitment, and relentless work ethic, he has contributed greatly to the development of youth, ages 8 through senior in high school. Chief Bankowitz has been a positive role model for twenty years, promoting character-building and fostering a sense of personal responsibility. He exemplifies the traditions of dedication to God, Family, and Country, and possesses an unflagging sense of duty and an unparalleled commitment to youth, that rise far above all standards of excellence. The Miami Valley community is truly privileged to have John Bankowitz in their midst.